First details have been released of an all-new Kia Sorento, the firm hoping it’ll be able to take a few more scalps from rivals such as the Honda CR-V, fellow Korean offering the Hyundai Santa Fe or even the new Lexus NX. Initially launched in 2010, the replacement model is lower, wider and longer than ever before. It’s seven-seat only for the UK market and gets a single 2.2-litre diesel engine – exactly the same as the previous version following its 2012 facelift. We’re expecting similar equipment grades too: KX-1, KX-2, KX-2 sat-nav and KX-3. Also the same are the gearbox options, with bottom-spec KX-1 versions getting a manual only, KX-3 getting automatic only, and all other trims a choice of the two. 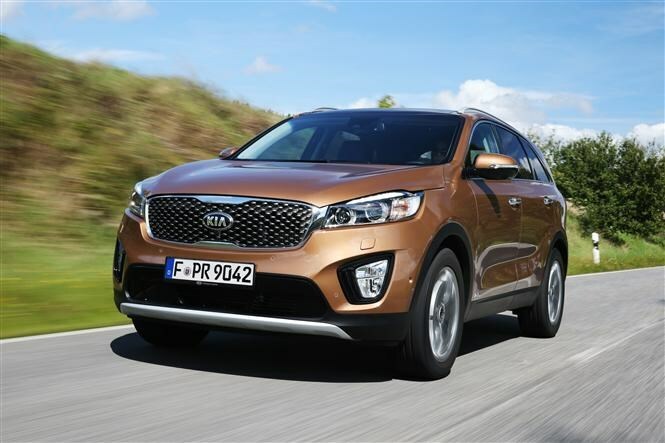 You’ll be able to spot a new Sorento by its revised front and rear bumpers and long wrap-around headlamps. The nose features a tweaked representation of the Kia family face, while a lower roofline makes the car look more aggressive than before too. The second row of seats splits in a 40/20/40 style and will slide too to allow easier access to the third row. Furthermore, thanks to an extension of the car’s length and width, the boot has expanded from 515 to 605 litres and there’s a new underfloor tonneau cover storage compartment along with a longer cargo bay floor. All three rows now have more headroom and legroom too. 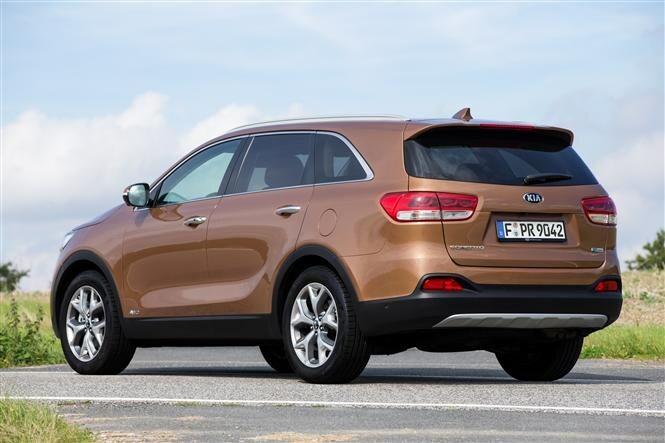 Kia is promising improvements to the Sorento’s steering and suspension, aiming to make the ride quality more comfortable and the steering quicker and more responsive. We’re not sure if the unpopular Flex Steer system – which allows you to vary the weighting but not feel of the steering – will be installed. Safety is obviously more important than ever as well. The Sorento’s structure is significantly stronger and a portfolio of active safety technologies are available including adaptive cruise control, lane departure warning, blind-spot detection, speed limit sign recognition and rear cross-traffic alert – which will warn you if the car senses a vehicle about to traverse the rear of the Sorento while you’re reversing. Other new technology is set to include an around-view monitor system – which uses four cameras to give the driver a bird’s-eye view of the car to help when parking – and a remote automatically opening tailgate which will open the load space for you if the key is sensed in close proximity to the boot. The all-new Kia Sorento will break cover at the Paris Motor Show this week, with deliveries starting in spring 2015. While prices haven’t been announced at this point, it’s likely we’ll see a modest hike over the previous-generation Sorento. The New Kia Sorento New Kia Sorento rear view.